Peace Frog is an English language printed zine published in Greece. 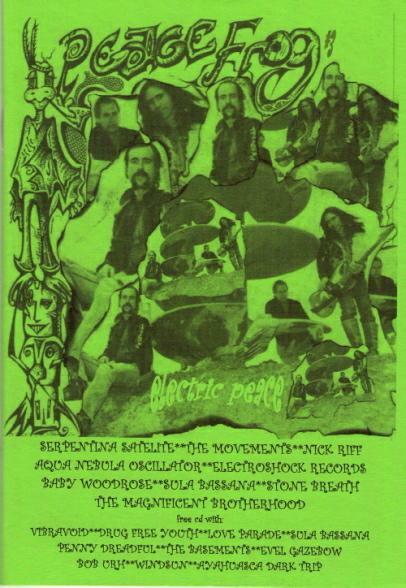 Nearly 80 pages, the mag is packed with articles, interviews and reviews covering the contemporary Psychedelic and Space Rock scene, and everything and all connected to this music. Artists profiled/interviewed include Baby Woodrose, The Movements, The Magnifcient Brotherhood, Serpentina Satelite, Timothy Renner (Stone Breath), Aqua Nebula Oscillator, Dave Schmidt (Sula Bassana), Nick Riff, and Artemiy Artemiev (Electroshock Records). The mag includes LOADS of reviews. AND you get a free compilation CD titled "Peace Frog In Space Test" with tracks by Vibravoid, Sula Bassana, Drug Free Youth, Love Parade, Evel Gazebow, Bob Urh, Penny Dreadful, The Basements, and Ayahuasca Dark Trip. There's not too many hard copy mags covering music like this these days and these guys are doing a damn good job. The folks who publish Peace Frog also run the Nowhere Street Music label which recently put out a gorgeous vinyl 7" by Vibravoid and have releases by Drug Free Youth and The Voyage Limpid Sound.